Smack dab between Zion National Park and Red Cliffs National Conservation Area lies a small, abandoned town that was the place to be, be seen, and get rich in the late 1800s. 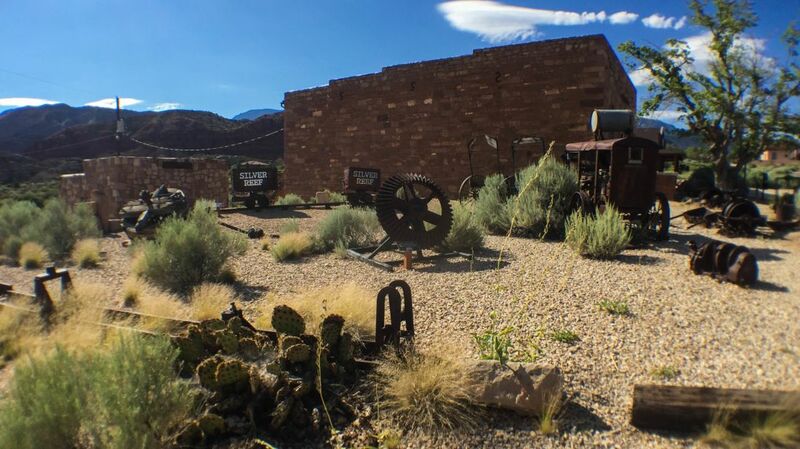 Silver Reef, Utah, one of the Southwest’s most popular ghost towns, was a flourishing mining spot back in the day, filled with western saloons, old prospectors, and plenty of shoot-outs. While Silver Reef is all ruins, no riches today, its crumbling rock walls hold an interesting history for visitors who take the time to stop by. Silver Reef’s story starts in 1866, when the prospector John Kemple uncovered a vein of silver in the town’s sandstone—a first-of-its-kind discovery. Geologists spent years refuting his claims, until a group of bankers from Salt Lake City caught wind of the breakthrough and staked their mining claims in the Silver Reef region. Silver Reef quickly evolved into a flourishing mining town, with 33 mines that produced more than 7 million ounces of silver. During 1879, its peak year, the town boasted a hotel, boarding houses, stores, saloons, restaurants, banks, a newspaper—the Silver Reef Miner—and a population of more than 1000 people. And, like all good ghost (town) stories, Silver Reef was full of seedy characters who brought gambling, prostitution, shoot-outs, violence and all those The Good, The Bad, and The Ugly-isms to town. After a major fire and many miner strikes, Silver Reef went on the decline in the 1890s before turning into the abandoned roadside ghost town that it is today. 1. The Silver Reef Museum is housed in the oldest Wells Fargo Express Station still in existence. Built in 1878, silver was guarded at and exported from the old station, which made it an integral part of Silver Reef’s prosperity. Today, the museum houses old bottles, guns, carpentry tools, and other historical items that help illustrate the mining life of yesteryear. 2. The Cosmopolitan Restaurant was owned by a Bavarian woman who is said to have made some of the best hash in the west. The original building was dismantled in 1895, at the tail-end of when locals were in a mass exodus from the imploding Silver Reef, but a replica of the Cosmopolitan still stands today. 3. Silver Reef’s Main Street was filled with flourishing, bustling businesses, such as the Louder General Store, which was run by the town newspaper's editor. Today, it’s everything you’d expect from an abandoned old ghost town—tumbleweed, cactuses, crippled buildings, and an eerie desert silence. 4. The Elk Horn Saloon was once easily recognizable because of the giant elk horns mounted to its front sign (which are now on display at the town museum; the saloon is no longer standing, and is now marked by a large sign). For about 15 years, the bar was run by a successful German owner who gave out free food to get people drinking. According to Silver Reef historians, the saloon owner’s business luck nearly wore out when he ousted a man for eating—but not drinking—at his bar. The angry patron came back with a vengeance and a gun, and in typical old west fashion, initiated a shoot-out. Fortunately for the community, the man missed five times, so the staff kept working and the drinks kept a-comin’. Silver Reef is located in Leeds, Utah, right off I-15. It’s 40 minutes west of Zion, 30 minutes northeast of Red Cliffs, and—ironically for a ghost town—is adjacent to an upscale neighborhood with satellite dishes and swimming pools. Someone’s gotta keep the tumbleweed in line, right?